You may think that veganism is a new hipster-related trend, but actually this form of “extreme” vegetarianism was founded back in 1944 by a group of vegetarians who called for a “new way of living” by throwing out all animal-made products from their lives, and this includes not only the food, but any other products made from animals or tested on animals, such as leather boots, wool socks and even silk linen. Vegans define veganism, as a natural extension of vegetarianism, which is the basic element of leading a cruelty-free lifestyle. According to the followers of veganism, their lifestyle choice provides a number of benefits to the animal lives, as well as to the environment, plus according to them it makes them healthier. While, we have to agree that the animal cruelty part is quite logical, the question is whether the vegan diet is the natural diet for human beings, and whether it is as healthy as vegans claim it to be. According to vegans, taking out all animal-based components from the everyday diet leads to a healthier, lower-fat, cholesterol-free and high in fiber diet, which we must agree – sounds healthy. According to those who support the vegan diet, and a publication in the Journal of American Dietetic Association (No. 11 from 1997) this reduces the risk of heart disease, strokes and heart attacks, obesity, high blood pressure, diabetes, osteoporosis and even several types of cancer. On the other hand, there are a number of nutrition specialists who claim that the vegan diet may lead to malnutrition because of the limited number of food types and nutrients which vegans can actually consume. The lack of protein, calcium, iron, zinc and vitamin B12 in the human diet may cause serious health issues, according to the Academy of Nutrition and Dietetics. The deficiency of these nutrients can lead to serious health conditions, including: anemia, blindness, weakness and osteoporosis. These nutrients may be provided through some animal-free products, such as certain types of mushrooms, soy based tofu and other foods, but vegans should be careful about getting sufficient amounts of all these food elements which are essential for the body’s health and proper functioning. 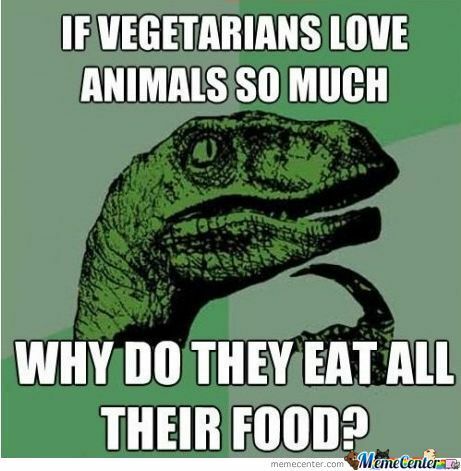 Meme: If vegetarians love animals so much… why do they eat all their food? There are some opponents of the whole vegan movement, who claim that it is more of a pseudoscience, rather than a scientifically proven healthy way of living, and that it has unrightfully been promoted as such even on serious web sources such as Wikipedia, for example. A more moderate approach may be that the truth lays somewhere in the middle. While yes, a lots of people choose to give up consuming meat because of animal cruelty and an ethical point of view, there are communities and people, whose survival is based on these products. For example, imagine trying to survive leading a vegan lifestyle in the harsh conditions in which Eskimos live for example. Not being able to eat meat, use the animal fat and fur will surely mean dying in the grueling conditions in the Arctic, where hardly anything grows. This is just one interesting discussion which has been ongoing in the animal-rights protection groups. In the US and the rest of the modern world, it is much easier to find vegan food, animal product substitutes and all the necessary nutrients and supplements in order to get the right amount of nutrition to stay alive and healthy, but in poorer countries or those with harsh climates and limited resources, being a vegan is in most cases practically impossible. 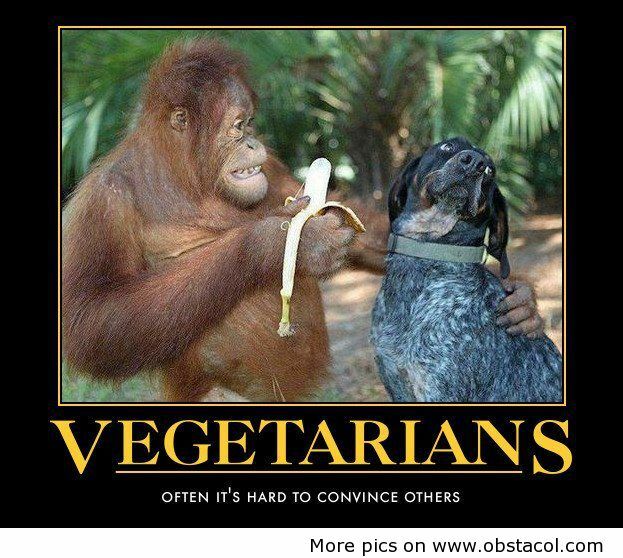 Meme: Vegetarians. Often it’s hard to convince others. Another counter argument of those who don not agree to the idea of veganism is that the limited foods which vegans can consume actually force them to take more artificial supplements and nutrient sources, which is actually an unhealthy practice. Some argue that the majority of multivitamins for example, are synthetic rather than whole food products, and may contain a number of ingredients which aren’t healthy at all, such as: polyvinyl alcohol, polyethylene glycol. But vegans need to consume some vitamins and minerals through alternative sources such as these supplements, in order to stay healthy. For example, Vitamin B12 occurs naturally only in animal cells and mold cells and yeast. The problem is that there are vegans who avoid yeast and any other bacterial products. This causes the need of getting a supplement to provide the body with this essential vitamin. On the other hand, the ethics and environmental concern behind the idea of veganism is one which is hard to disagree with. Definitely, the majority of the people are shocked when shown animal mistreatment or animal, fish and poultry cruelty horror pictures or footage. This is becoming a widely popular way to promote animal rights via the social media and the web, and the reactions, the huge response and comments to such posts speak for themselves. Opponents to veganism point out the somewhat more absurd and extreme view that a few bees can be killed whilst the honey is extracted from their hives, which is why some vegans choose not to eat honey as a sign that veganism cannot be considered as a serious lifestyle philosophy. Furthermore, those opposing the idea of the total removal of all animal-based food from the diet claim that there is absolutely no scientific proof of the benefits for human health from following such a diet, as most vegans claim. The environmental factor is another plus of the vegan ideology. The fact is that animal agriculture is a big contributor to a number of environmental problems, such as greenhouse gas production, increase of the carbon print, soil erosion, contamination of groundwater and depletion of wilderness areas. Also, according to a number of studies, the societies in which meat is the main food element, are those with the most inefficient resource management and food production. The thing is that like it or not veganism is becoming more and more popular in the US and around the world. With a number of celebrities and even politicians turning vegan, as well as the rising number of vegan meals, restaurants, and even a vegan Domino’s pizza, more people are choosing to become vegan. The statistics show that 5% of the American population is vegetarian, and about half of them are vegan. This means that around 7.5 million people in the US have rid themselves from any (or at least most) animal-based foods and products. The truth is, that there is no straight answer to the question whether veganism is healthier than other diets. Only time will tell whether vegans have made the proper health choice in the long run. I know a guy who’s a “fruitarian” – he’s not just a vegan, not just a raw-food vegan, but his primary source of nutrition is fruit. Entire meals of nothing but fruit. He even goes to Fruitstock and meets like-minded people. He supplements it with vegetables, nuts, seeds, &c, but that’s all secondary. I don’t see how that’s healthy, but he visits the doctor regularly and is in the best shape of his life, and he’s always posting research articles defending vegan/fruit diets. Weird. That is weird. I was a raw food vegan for 3 years (did the fruitarian thing many times in that phase) and vegan for 13. At the time I thought it was going to heal me and make me healthy. There is something to be said for believing in something and then it works – could be true for this guy as it seemed was for me at the time. I did that from age 16 to 30 and now I have bipolar and borderline personality disorder, and eating ketogenic with plenty of meat is slowly starting to reverse the damage I did to my brain and nervous system. I too felt great in the beginning of my vegan/raw/high carb fruit days, and am now having people who care about me tell me how disconnected and disassociated from reality I was, could not relate with me, and of course now with the mental illness I would not go that route again. There is no science to back up being vegan and eating all fruit. I love fruit. I love it so much I used to joke about being a fruitarian, until I found out that that was a real thing, at which point I got annoyed with humanity and stopped joking about that. I grew up in a tropical area where apples were a really expensive import, and so as soon as I got back to the states, I naturally became an apple addict. Then I got IBS. Then I learned that sugar substitutes ending in -ol wreak havoc on my digestive system. But I kept having problems, and I kept eating all of the apples. Then I learned that apples are one of the many fruits that have naturally occurring sorbitol in them. I was sad. I ate all the apples anyway for a little while, but finally got tired of being all bloated and balloon-like. I now eat one apple three times a week or thereabouts, and my digestion likes me a lot better. For me fruit is a double edge sword. On one hand, it has tons of vitamins, antioxidants, and other micronutrients that are good for you. On the other hand, it is loaded with sugar. As someone who is actively trying to loss weight and a lot of it, sugar and the empty calories from it just seem something worth avoiding. All this in mind, I treat fruit as candy from nature. Something for an occasional treat but not a staple. To bloster that belief, I did some blood sugar testing after eating an apple and eating a chocolate bar. Both had pretty similar spikes in my blood sugar. Even then, when I do eat fruit I go for the lowest sugar fruits possible like berries and apples.